L.A.'s historic South Broadway theater district in the 1940s. The Orpheum was a particularly apropos choice for “The Artist” to re-create silent movie premieres. The theater opened its doors in 1926, and was a showcase for not only silent films – for another year or so, until talkies revolutionized the movie business – but also live musical and vaudeville acts. Many performers saw their careers launched at the Orpheum, including a pre-Wizard of Oz Judy Garland (still known as Francis Gumm back then). 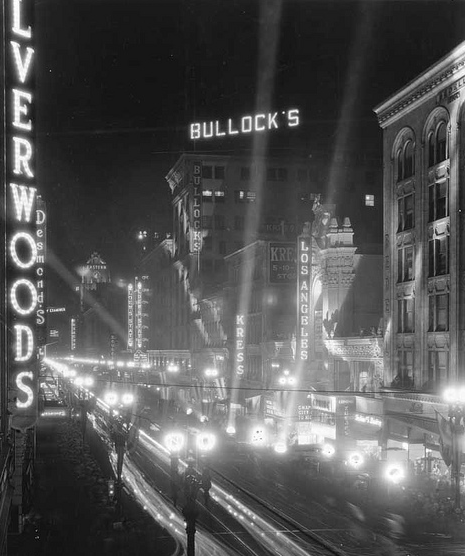 The Los Angeles Theater grand opening in 1931 for "City Lights"
The Los Angeles Theater was used for the premiere of George Valentin’s final flop. Maybe it is an apropos choice too, as its grand opening in 1931 hosted the premiere of Charlie Chaplin’s “City Lights”. Chaplin and his films were cited by “The Artist” director Michel Hazanavicius as inspirations. The Orpheum and the Los Angeles (as well as the nearby Palace) were saved from the wrecking ball in recent times, and gloriously restored. The historic Wilshire Ebell Theater also doubled as an auction house in the movie. What about those palatial homes shown in the film? Real houses – with real historical significance! Two residences on Franklin Place in L.A. were used – Peppy’s house was really actress Mary Pickford’s house during the late teens (1917-1919, give or take a year) when she was secretly dating actor Douglas Fairbanks – to whom she was later married. Busby Berkeley bought Villa Guasti in 1937. 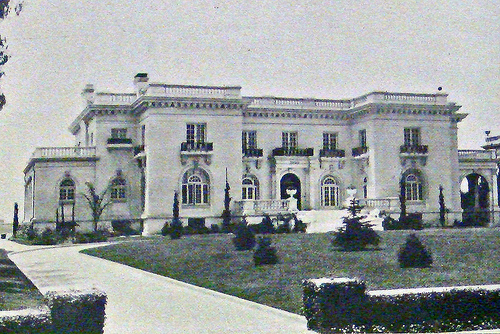 Also shown was Hollywood musical maestro Busby Berkeley’s mansion on 3500 W. Adams Blvd. in Los Angeles. Some may know it also as Villa Guasti – the name of the family who commissioned its construction in 1909-1913. The lavish Bradbury Building (circa 1893) – another restored masterpiece in downtown L.A. – was the site of the movie’s “Kinograph Studios”. The building has been used as a movie set before – notably in “Chinatown”. Exterior shots were mostly filmed in the Greater Wilshire/Hancock Park area, west of downtown Los Angeles. Want some specific addresses? Try Oakwood Ave. between Beverly Blvd. and Melrose Ave.; Hudson Ave., near the Wilshire Country Club, between 3rd St. and Beverly. The restaurant scene? Shot inside Cicada’s, on Olive St., in downtown L.A. Various exterior shots using monolithic, non-descript buildings were actually shot at a Southern California Edison (the local power company) Art Deco-era building near downtown L.A.
And what about that scene of the famous “Hollywoodland” sign? “CGI,” answers Mr. Hazanavicius. 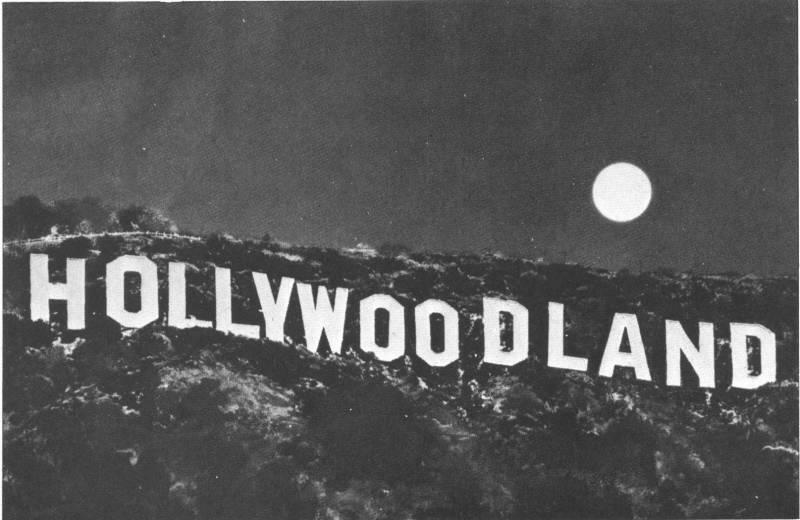 The “land” part of the iconic sign, erected in 1923 for an intended 18-month period, was removed in 1949. Got more questions about locations in “The Artist”? Let me know; I’ll try to answer them. I recognized Cicada right away – what a great location. And I’ve always wanted to go into the Bradbury Building, but they rope off the entrance and you can’t enter unless you work there. Patrick, if you go on the weekends you can enter the building, but they just don’t allow you to go upstairs or in the elevators. I have been in there several times. Thanks for the list.I was so sure I’d seen some Pasadena locations..but maybe not. I saw some of what I thought was Glendale, because of the street lights. But apparently Hancock Park had the same street light supplier! am looking for an exterior shot of the the home of george valentin in the artist. can anyone help? thank you. The home is located at 104 Fremont Place West, in the Hancock Park area of Los Angeles. It’s a gated community of very exclusive homes. #104 is “a chateau style residence built in 1930 by Charles J. Wild, owner of a metal casting company. The home cost over $300,000 to construct. Elmer Gray was the architect. Paul J. Howard designed the grounds and gardens with interior decorations and furnishings by John B. Hortzclaw,” according to a historical society’s accounting of Fremont Place homes. It was also used as a location in “The Kid” (2000). Jerry, great information. Do you know the location of the restaurant where Peppy was giving the interview which George overheard? The restaurant scenes were all supposedly shot in Cicada’s in downtown LA. Check out http://www.cicadarestaurant.com/ to see their photo gallery. It certainly “looks the part”. The Bradbury Building also got a part in Wolf (Jack Nicholson and Michelle Pfeiffer), playing the publishing company where Nicholson works, He walks into a door in Manhattan and miraculously winds up in LA. I been inside (at, coincidentally, a book biz party). It’s FAABulous. loved the movie and love and recognized several of the scenes. There are some though that i was almost certain were shot in the universal backlot area. The street layout, the buildings and background matched to a few of the sets in the lower tram route. Am i mistaken? You are correct, but I could not cite specific locations. I’m interested in the gate at Kinograph studios. It reminded me of the old Paramount gate on Bronson. Was that intended – or am I remembering another gate? Your memory serves you well! The one brief interior scene of an elaborate theater staircase looked so much like the interior of the Stanley Theater in Utica, NY that I must ask where that scene was actually shot. 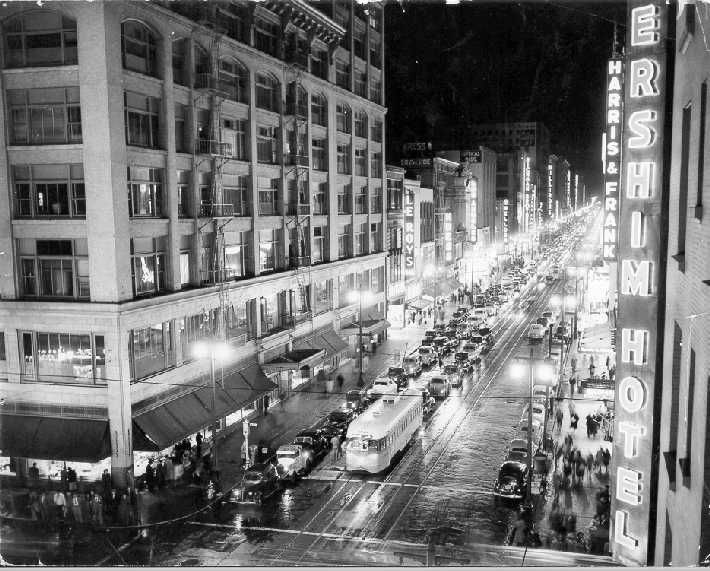 All the theaters used were reportedly in downtown Los Angeles. One of the premiere scenes, however, looked like a set to me. 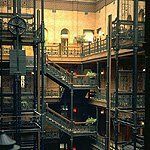 The Bradbury building was also used in the final scene of Blade Runner..once you recognize the metal grills, youll see the interior in many many more movie sets..they have a website, i recommend checking it out, it will tell you alot of the movies it was used as a backdrop.. The Bradbury Building was also used in many tv series shots, more particularly Banyon starring Robert Forster, the actor that played the bail bondsmen in Jackie Browne..you will also see it in the Janet Jackson video, Rhythm Nation..the guy that built the building was a mining mogul, had a mine in Mexico, and it was a real labor of love for him..and, for a smallish building, he spared no expense on the interior, a so called Italian Renaissance style architecture.. When did production/filming of The Artist actually begin ? I will have to double-check that, but I thought it was the fall of 2010. Paramount and Warner Bros were definitely used, as well as other locations that have not been specifically mentioned. I think you are correct, however, about the white bungalows. Dear Jerry …. first of all – A huge THANK YOU for assembling this – I just saw the film – Day after the Oscars .. and I recognized so many of the locations .. and full of questions .. many of which have been answered. (Very grateful for that.) I lived in the Beachwood Canyon section of the Hollywood Hills for years … and in the scene in which you say … they used CGI to make up the “Hollywoodland” sign … Question: Is the entire hill, with the whole sign all CGI? And picked a street that resembled a Hollywood Hills street? Or did they pick a street that did have the Hollywood sign in the background … and just CGIed the “land” bit in? I’m curious if they used Beachwood Road, or Ledgewood Drive, or Durand Drive. There are actually so many sections and pieces of road, with the hill in the background …. That even after 11 years living in the area … I can’t spot the section of road they may have filmed. Thanks for your kind words. I’m traveling now, and don’t have access to the book I am thinking about, but I think it is called L.A. Then & Now, where they show locations around L.A. from the ’20s, ’30s, ’40s and ’50s. And then they take a picture in the same area today (or when the book was written – which must be 10 years or so ago, by now). There is a shot in there of someone coming down that winding road Peppy’s bus came down, with the Hollywoodland sign in the background. I could swear they have re-created that scene. Or something very close to it. But I would say most all of the mountain has been CGI’d into that shot. Sorry I can’t confirm the street, but believe it was in the old Beachwood Village area. I just saw the movie The Artist. Where was the film location of the entrance to the hospital? It looked familiar, like my old high school in Monrovia, Calif, where many movies are made. Virtually all the scenes were shot on L.A.’s westside. Not sure is this info has been posted here yet, but the building used as the hospital was the Warner Bros Building on the American Film Institute campus in Los Feliz. The address is 2021 North Western Avenue. I visited the Bradbury building when I was in LA … the security man was happy for me to take pictures, with the proviso that I only went to the top of the first flight of stairs. Outside there is a small info plaque on the street light post that gives some info on the movies shot there. That’s good to know. Thanks! I’d like to see that. This site was wonderful thank you very much for all the information. We went to see the movie today and it was great. With seeing the movie and then viewing your information we saw a lots of places we saw in the movie. Thanks! It is surprising – and wonderful – how much of “old Hollywood” still exists! The film makers were brilliant in finding and using the historic places. A lot was On the Paramount New York backlot as well. Thank you! Although I loved “The Descendants”, I thought “The Artist” was a landmark film and more deserving of all the Oscars. I wish more people would have seen it. But I guess the people who understand cinema, and care passionately about it, did! Do you know anything about the interior shots of peppys house. Thanks jerry. I was told the interiors of Peppy’s house were the actual Mary Pickford house (exterior shots in the movie were the same house). Miss Bejo said the bed shown in the movie was Miss Pickford’s actual bed. The DVD is now out, however, and there is supposed to be a detailed segment on filming locations. Maybe they will have better info. Not sure if this info has made it to this post: George Valentin’s Duplex, the one that caught fire, can be found at 4056 West 21st Street in Los Angeles.